I think now is a good time for a nice reveal. I feel good about this. And this is a great way to end the year. I'm really proud of contributing to this 7 years ago when Rang De first began. The amount I contributed equaled about a years worth of income from work. I put the money into Rang De for about a year or two and then stopped. While most people put their money into real estate and the stock market, I put mine into people. Rang De is a microfinance nonprofit organization in India and the average loan is about $100-$250 each. It helps out people in the short term and for some it really changes their predicament. The average loan is paid back in a year and that money is then loaned out to another needy person. The interest (for India) is reasonable. In the beginning it was around 7%. Now it is closer to 10% I think. The interest goes to pay staff to disburse and collect the money and to seek potential candidates for loans. So on a $100 loan, $7 to $10 is used for the overhead which, in my opinion, is highly efficient, considering travel and other expenses. 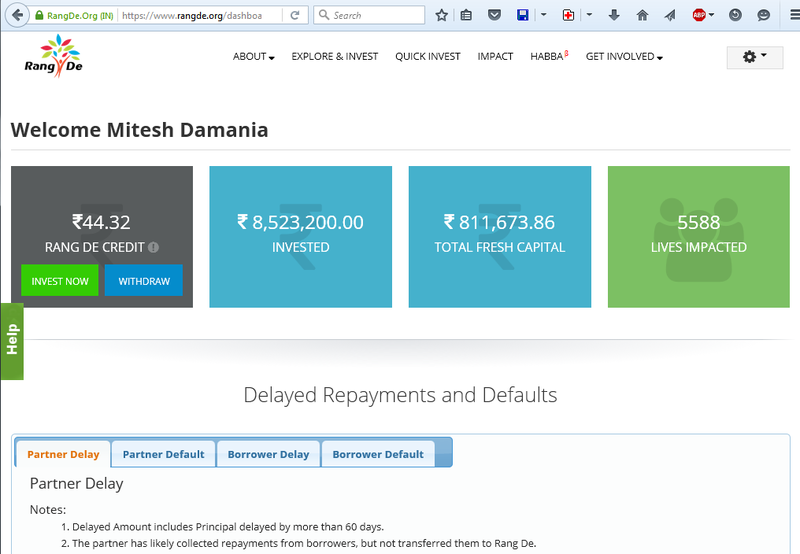 8,523,200 rs loaned out which is about $129,000 USD with the current 66 rs to 1 usd exchange rate. Mind you, I put nowhere near that amount in. The high amount comes from recycling the money numerous times, and I'm pleasantly surprised it's so high. Number of loans which I contributed to wholly or partially: 5588. This means I contributed to the betterment of about 5588 individuals. (I think a very small fraction of the loans are re-loans - same individual receiving another loan after the previous loan is paid back). Oh and yes, loans have been forgiven due to death, medical conditions, or natural disasters (mostly floods). And recently, Rang De has partnered with organizations like the World Bank. Hey, the World Bank has to do some positive work too to not look so sinister. What Rang De does is loan out to individuals and cooperatives so if the World Bank wants to help out with that, let them. So from my small contribution there's been a difference somewhere in the world. I have more to say about the program, its impact, and what the unintended consequences may be. I will have more posts on this.